UPDATE JUNE 27TH: WWF welcomes the Lao Government's decision to have the Don Sahong hydropower project undergo a formal consultation process, a decision likely to delay construction of the project. The consultation process requires Laos to hold inter-governmental consultations before proceeding with the dam, and conduct and share studies on the project's environmental and the social impacts. The process will take at least six months to complete. "Laos is now promising to do what they already signed up to under the Mekong agreement, and should have done months ago" said Marc Goichot, WWF-Greater Mekong's lead on sustainable hydropower. "Their decision to consult on the Don Sahong project, and share critical details about the project's impacts, comes after intense pressure from neighbouring countries. It is critical that pressure is maintained to ensure Laos delivers on their promise." In September last year, Laos announced its decision to proceed with the Don Sahong dam, bypassing the MRC's consultation process. The much-criticised project was discussed at the June 26-27 meeting of the MRC - an inter-governmental agency made up of representatives from the four Lower Mekong nations -- Cambodia, Laos, Thailand and Vietnam. The Don Sahong dam threatens the Mekong's critically endangered Irrawaddy dolphins and will block the only channel available for dry-season fish migration, putting the world's largest inland fishery at risk. Close to 200,000 people have signed WWF's petition calling on the dam builder, Mega First, to pull out of the project. "We thank people around the world who signed the WWF's petition to stop the Don Sahong dam," added Goichot. "Mega First would do well to listen to the growing voices of opposition to this disastrous project and reconsider their engagement." The Don Sahong dam is the second dam on the Lower Mekong mainstem, following the controversial Xayaburi dam that Laos has begun constructing despite opposition from neighbouring Cambodia and Vietnam. "The Mekong River Commission's joint decision-making process was effectively broken in 2012 when Laos decided unilaterally to proceed with Xayaburi dam, against the express wishes of Vietnam and Cambodia," added Goichot. "There is currently little faith in the MRC's process to ensure joint decisions are made for the benefit of all Mekong nations. If Laos fails to be held to account, the MRC will soon lose its legitimacy and 60 million people living in the Mekong basin will suffer." Bangkok, Thailand – Four Mekong River nations meeting in Bangkok next week must prevent unilateral interests from shattering regional cooperation and joint management of one of the world’s great rivers, warns WWF as time runs out to halt the two controversial dams that could do irreversible damage to food security and critically endangered river dolphins. Laos announced its decision in September last year to proceed with the Don Sahong dam, bypassing the MRC’s consultation process. The much criticised hydropower project will be on the agenda of the June 26-27 Ministerial-level meeting of the Mekong River Commission (MRC) – an inter-governmental agency made up of representatives from the four Lower Mekong nations -- Cambodia, Laos, Thailand and Vietnam. The MRC’s Joint Committee failed in January to reach agreement on whether or not the Don Sahong dam is required to undergo regional decision-making, and elevated the decision to the Ministerial meeting. The Don Sahong dam threatens the Mekong’s critically endangered Irrawaddy dolphins and will block the only channel available for dry-season fish migration, putting the world’s largest inland fishery at risk. To date, close to 150,000 people have signed WWF’s petition calling on the dam builder, Mega First, to pull out of the project. Construction is scheduled to begin later this year. If the Don Sahong dam goes ahead it will be the second dam on the Lower Mekong mainstem, following the controversial Xayaburi dam that Laos has begun constructing despite opposition from neighbouring Cambodia and Vietnam. Earlier this year, 40 NGOs issued a joint declaration in opposition to the dam, and called on Thailand to cancel the Power Purchase Agreement relating to the hydropower project. 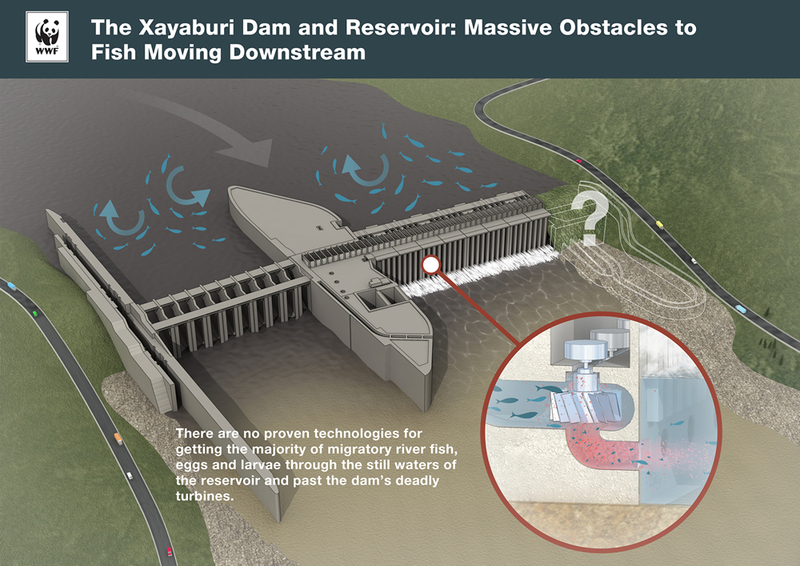 Expert reviews of Xayaburi dam have identified serious gaps in data and weaknesses with the proposed fish passes for the mega dam, and confirmed the project will block part of the sediment flow, destabilising the river’s ecosystem. Laos agreed to spend an additional US$100 million on modifications to the dam design in an attempt to mitigate the adverse impacts, but they are yet to deliver the redesign plans they committed to share in 2012. WWF urges Mekong Ministers to defer a decision on Lower Mekong mainstem dams for 10 years to ensure critical data can be gathered and a decision can be reached using sound science and analysis. The critically endangered Irrawaddy dolphin, Orcaella brevirostris, photographed at Kratie Province in northeast Cambodia. The Mekong dolphin population is estimated at between 66 and 86 individuals inhabiting a 190km stretch of the Mekong River between Cambodia and Lao PDR. 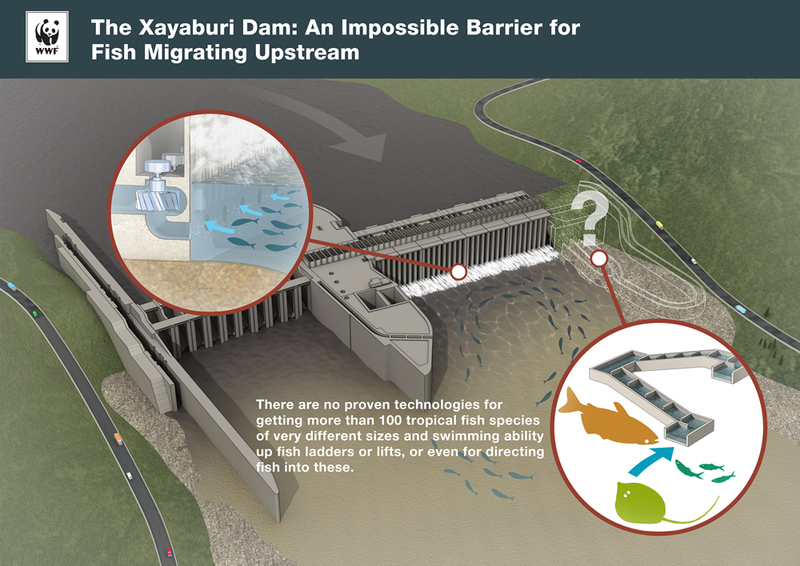 Infographics of Xayaburi dam construction and impacts to fish migration. 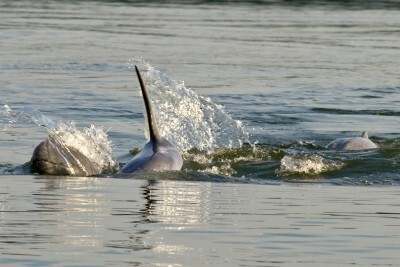 © WWF-Greater Mekong.